My piccolos have an arched back, but only arched not domed. I marked the rough outline on the inside and ran (more like wiggled) it through the bandsaw. Gotta love the mini bandsaw - I took it out from under the bench but had to clear a space for it. So I had it in one hand while I cleared the bench with the other. Big machines are great, but miniatures come in second, before mid sized. Then the body is sanded on my very fugly sanding jig. It's made from slotted mdf and scraps, but it still works. Some kerfed basswood lining strips are pre-bent to fit the sides. Notice that I stopped using end blocks a few piccolos ago. You can also see some of the friday night varnish I'll put on the inside, to get a glossy finish of the week. Then it's paper clip time, and the whole thing can rest until tomorrow. Now I'll watch a documentary about The Ramones, I think. And use that varnish. Yesterday I sharpened a bunch of tools on my Japanese water stones. 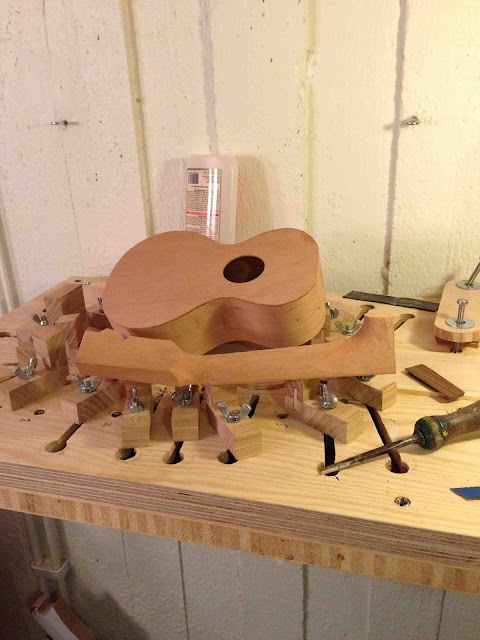 Then I carved the neck for the piccolo (which now has the one piece rim attached to the soundboard). My very best kept secret has to be the fact that I like planes. I like all sorts of planes, but small planes are even more special. Here you can see my smallest Ibex plane on the left, with a curved sole. 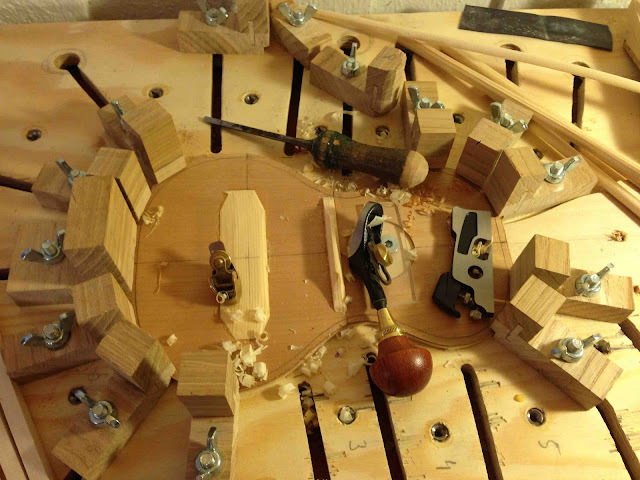 In the middle is a plane from Veritas, also curved in both directions and with an adjustable handle. And to the right is the miniature shoulder plane, also from Veritas. The piccolo is destined for Australia and my mate Chris. It feels like a relief to make one of these after the uneducated guesswork that surrounded the guitar-thing. Well. 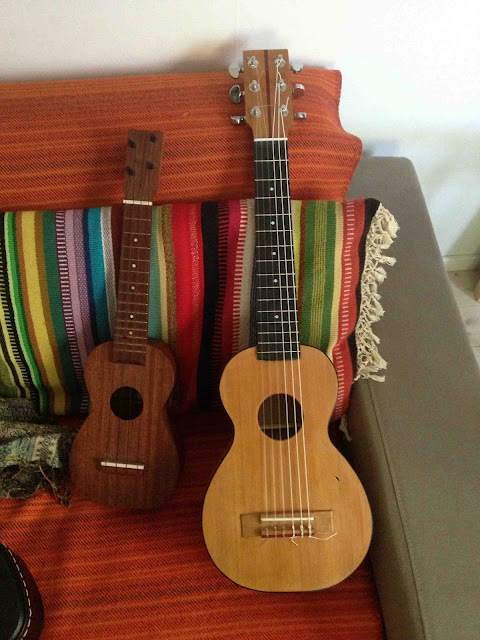 The Argapa number 60 is in fact a six stringed uke with sticky-out ears tuned as a guitar. 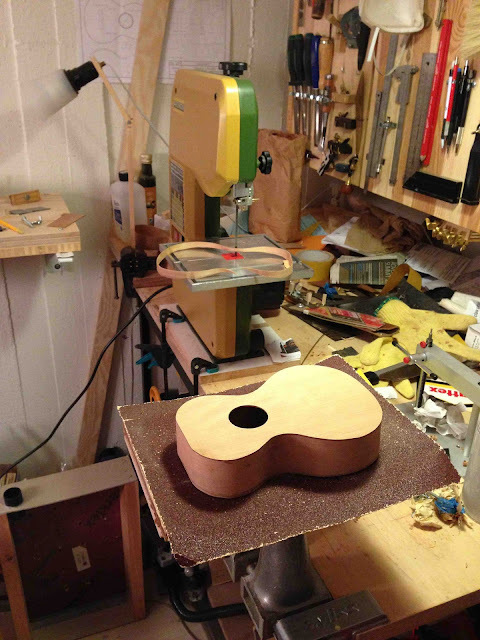 I cannot describe it any other way since I am so feckin' far from a guitar maker. Still it does sound half good! The strings are upside down since my nephew is a lefty and is learning guitar that way. I hope he isn't too disappointed when he sees it. 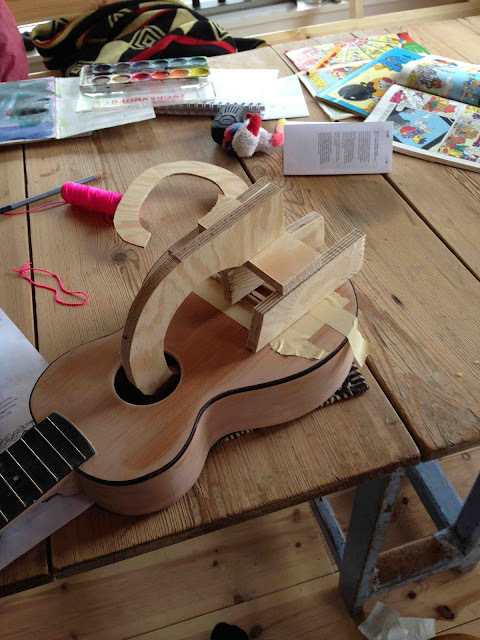 I continue to rush the small guitar towards a level resemblant to completion. Rush is, of course, hardly the word that would come to anyone's mind. But between other obligations and projects (you can see our wood fired pizza oven to the left of Li's head! ), I do my best. Today the bridge went on. But I had no clamp with a deep enough reach. So I made a c-shaped piece of plywood, three wedges and another straight piece. 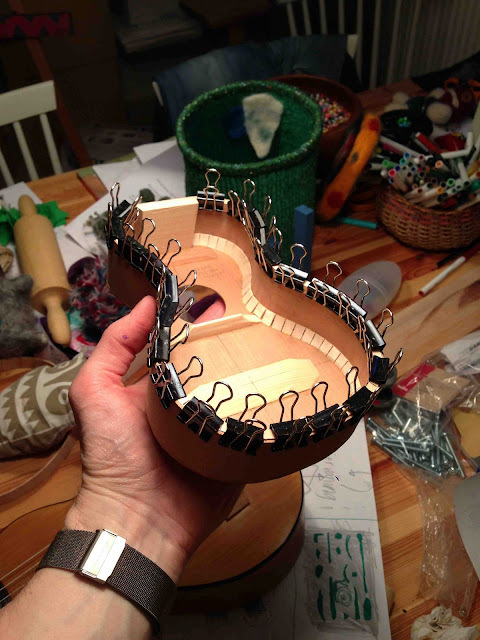 In the first pic you see them around the guitar, in the second you see the whole assembly. It's not perfect but the concept could be worth developing. 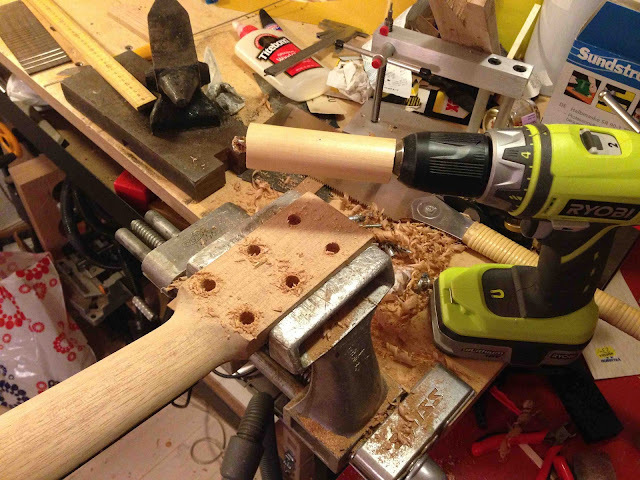 Sometimes a drill press is nearly indispensable. Or at least a sturdy stand for your regular hand held drill. 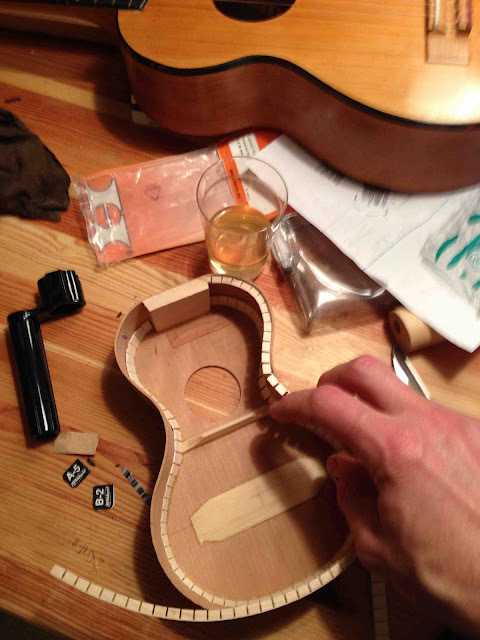 For example when you want straight holes of a certain depth, particularly when you need stepped holes for tuners. But I really prefer my cordless drill, it's so easy and I like to think I have a good enough eye to drill straight and perpendicular to a surface. The awkward bit is then the depth stop. It's possibe to buy depth stops for smaller diameter drill bits, but these holes were already 8 mm right through the headstock and needed counterboring from the back to 10 mm halfway through. And when enlarging a hole a drill bit grabs and goes down fast and forcefully. So I made an instant depth stop from a round piece of scrap. I set the drill bit to 9 mm proud of the end and it worked perfectly. Look at this, I got 12 sets of koa wood for sopranos! Most of them with one piece tops and backs. The eminent Pete Howlett was kind enough to sell me these. And he is the best shipper, these sets were packed better than anything I've seen. Now all I need is the time to build 12 sopranos. I'm a bit hesitant. It's going ok but I am not sure at all what it'll sound like. This reminds me of my first tenor, almost five years ago. 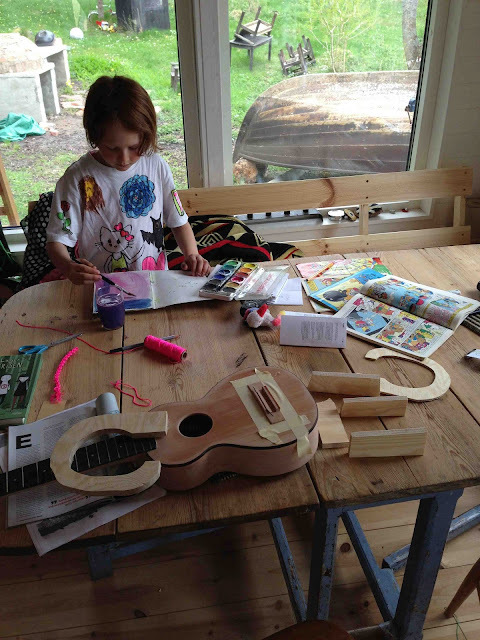 It was really hard fretting the ebony fretboard. I thought I had done that before but I would have remembered. Oh well. Lots of work left. And a vouple of weeks to do it.